If the attachments list is longer than the height of the attachments area, TheBrain shows a button for the hidden attachments. So far, so good. If one adds another attachment to this list (i.e. a screenshot), the new attachment is shown, but on the left in the list, its title is hidden. This is confusing. The title of the last new attachment should be always visible so that one can edit it immediately. In the video, I have made the attachments area very small, so only one attachment title is shown. Then I take a screenshot of Bill Gates and edit its title to 'Gates1.png'. Then I take a second sreenshot which is duly shown. But on the left, its title is hidden behind the '+1' button. To edit the title of the second screenshot I first have to 'unhide' it by clicking on '+1' to activate the title. This is confusing and two clicks two many. Thank you for your post. The hidden tab is dependent upon the dimensions of your window. I can see that your window size is pretty small. In order to condense the application to make it responsive to your window size, then it has to hide that extra tab at a certain size. Thanks for responding! But sorry, I guess, you got me wrong. In my post I wrote that I made the window intentionally small in order to demonstrate my point. I'm not complaining that TheBrain is hiding some tabs because of the small size of the window. The point is: If I add another attachment (say by taking a screenshot), this new attachment's tab should be visible immediately (replacing other tabs, if necessary), so that I can edit its title immediately without first unhiding the tab. 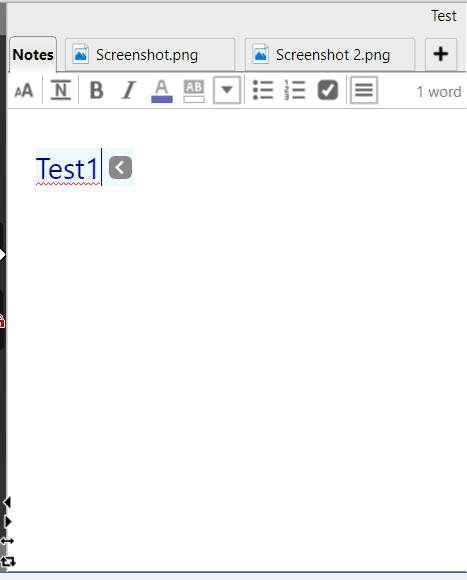 Right now, the new screenshot is visible, but its tab is not, so that two additional clicks are required to get to the edit field of the tab. Ideally, new tabs should always appear at the same place, preferably at the top of the tabs list right below 'Notes'. It one wants to get fancy, this could be made an option. Ahh, I see your point. That's a good observation. I'll be sure to document it as a feature request.